Traders are waiting for Italy’s political leaders meeting today. Yesterday was a quiet day for EURUSD due to the US holiday however, today US NFP data and President Trump’s threat to implement tariff on China will bring some volatility to the market. 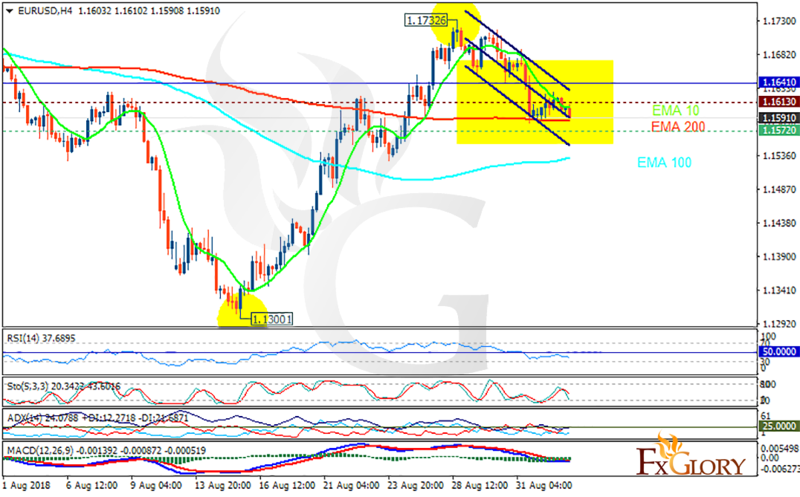 The support rests at 1.15720 with resistance at 1.16130 which both lines are below the weekly pivot point at 1.16410. The EMA of 10 is moving with bearish bias in the descendant channel and it is above EMA of 200 and the EMA of 100. The RSI is falling towards the oversold area, the Stochastic is showing downward momentum and the MACD line is below the signal line in the negative territory. The ADX is showing sell signal. The technical analysis is showing downward momentum, while 1.15 remain the floor of the market, the resistance level breakout will push the price up towards 1.17.